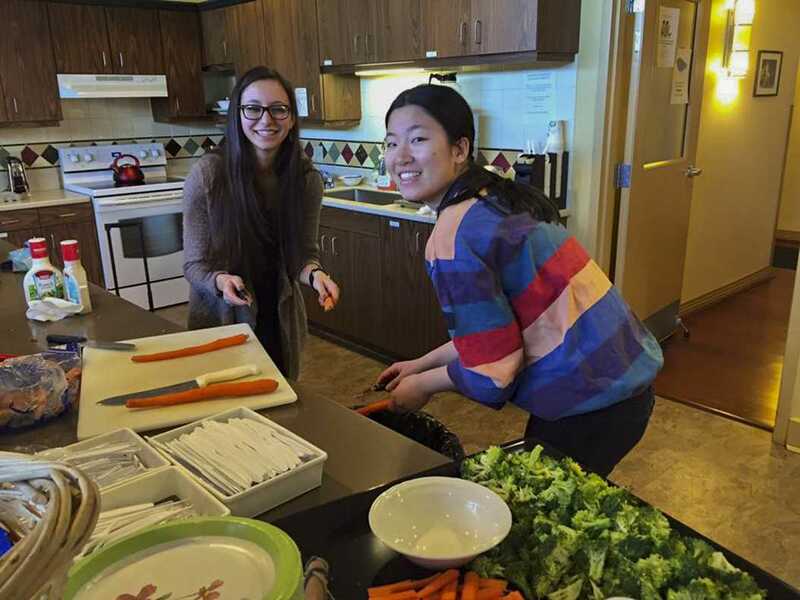 Pitt Food Recovery Heroes members Jessie Cohen (left) and Shutian Shen (right) prepare food at the Ronald McDonald House. | Courtesy of Jessie Cohen. As the doors were about to lock at closing time Friday afternoon, the Oakland Bakery and Market permitted a few last students to enter. But the group wasn’t there to buy last-minute coffee and pastries for the weekend. They were there to collect all of the shop’s unpurchased food, which they would donate to food banks through the campus student organization Food Recovery Heroes. Food Recovery Heroes is Pitt’s chapter of the national Food Recovery Network, which is a coalition of 191 college student organizations committed to reducing food waste on campuses by donating goods to the food-insecure. According to the Greater Pittsburgh Community Food Bank, 14.2 percent of people living in Allegheny County are food-insecure. The efforts of such organizations as the Food Recovery Heroes attempt to provide relief to this burdened portion of the population and contribute to more sustainable food practices at the local and national level. And recently, Food Recovery Heroes has expanded its efforts to form a collaborative campus initiative that spans from student organizations to Pitt’s staff and administration. Beginning Monday, they expanded to daily food pick-ups from Market Central, a new initiative the group hopes will dramatically increase the amount of food recovered this year. At the end of the day they will be recovering all trays of prepared surplus food that does not get served to students. These efforts haven’t gone unrecognized — Pitt is the ACC’s first school to be designated as “Food Recovery Certified,” a label Food Recovery Network designates to universities in recognition of their commitment to food recovery efforts. Jessie Cohen, a senior social work and communication major, co-founded Food Recovery Heroes three years ago with then-senior co-founders Jonae Lloyd and Sam Ministero. Coen said they started the club after they found a solution to salvage all the unused food they saw at campus eateries. “We realized that there was something we could do on campus that makes it a lot more sustainable, and we could really feed our neighbors so easily by repurposing food that would otherwise be wasted,” Cohen said. The club’s recent visit to the Oakland Bakery was one of four coordinated that week, which collected any unsold salads, sandwiches, donuts, cookies and pastries that would have been wasted if not gathered and donated to local organizations and food banks like Pressley Street High Rise, Jubilee Soup Kitchen, Finello Pavilion, Community Human Services, Pitt Pantry, Focus Pittsburgh and School 2 Career. Food Recovery Heroes also collects from Market To-Go, Market Kosher, Einstein’s Posvar, Einstein’s Benedum and the FeelGood Deli. Although the group has about 30 active members, the amount of work required to recover that much food a day sometimes exceeds their capabilities, so Food Recovery Heroes works with other campus organizations, including the Arnold Air Society, Pitt Green Team, Free the Planet and the Student Civic Engagement Council. During its time at Pitt, Food Recovery Heroes has recovered an estimated 4,000 pounds of food annually, but this year it hopes to double that amount to 8,000 pounds. “The extra 4,000 pounds are going to come from all the food that is made in Market Central and the Perch that students don’t get to,” said Cohen. The expansion to Market Central and the Perch offers Food Recovery Heroes a significant opportunity to increase their collection numbers because of the substantial amount of food produced in a day. Market Central chefs produce food to provide 35,000 to 40,000 meals per week and 5,000 to 6,000 per day, “but every day is different — I can’t know how many people are going to come in each day,” said Executive Chef Chris Cox from Market Central. The group’s expansion to daily pick-ups at Market Central requires the entire staff’s involvement, so Pitt Dining Sustainability Coordinator Nick Goodfellow, who has been coordinating with Food Recovery Heroes to implement their initiatives at campus dining facilities, introduced them to these new efforts at their orientations in August. “Everybody really gets it. Market Central staff has seen the food waste, they are familiar with it, so they are really excited that something like this is happening where all this food waste is getting recovered and donated,” Goodfellow said. The Market Central staff was informed to move any trays of prepared but unserved food, that previously would have been thrown away, to the kitchen’s freezer, where Food Recovery Heroes will recover it from. After the food is recovered, it’s donated to several organizations across Pittsburgh, reducing food insecurity in a region known for its food deserts — areas where it’s difficult to access affordable and high-quality foods. “If people in the community don’t have access to food, it is so disappointing when we are on a campus where you see all this food being thrown away,” Cohen said. Food Recovery Heroes’ work has yielded positive results for the community, according to Hana Uman, the program manager of 412 Food Rescue, which connects volunteers like the Food Recovery Heroes with community organizations in need of fresh food. Solving food insecurity issues is a passion for Cohen, and through Food Recovery Heroes she has been able to make local and national connections that serve to alleviate the burdens of food insecurity. “Shelter and food are the most basic human need that everyone deserves to have, and if there is something like this that is so simple to coordinate to help out with that, it really does strengthen the whole community,” said Cohen.